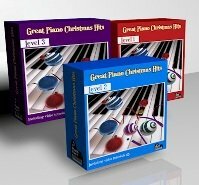 These Chritsmas piano sheet music are for more advanced students, where the songs are arranged beautifully, with a rich and warm sound and harmony, yet not too difficult to play. After all, our aim is to teach you how to play many Christmas songs. If these sheets are too difficult try to play these songs at level 2 and try these ones once you improved your sight reading skill. Click here if you haven't signed to Piano Playground, our free E-zine. Make sure you do that in order to get the USERNAME and PASSWORD for the Christmas sheet music I provide here under.